“Gabriela Martina’s Swiss roots offer an incredible range as she practically yodels her way through “Narcissus” en route to her mostly originals program on No White Shoes.” -John Ephland, Downbeat Magazine (4/5 stars). 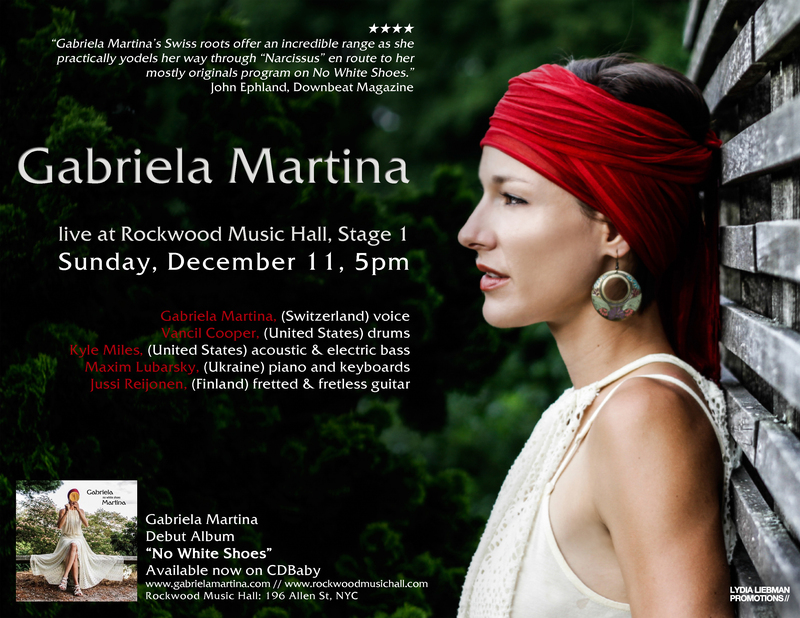 Rockwood Music Hall, located at 196 Allen Street, in New York, New York, is proud to present vocalist Gabriela Martina on Sunday, December 11, at 5pm. There is no cover, though there is a suggested donation of $10. More information can be found online at www.rockwoodmusichall.com. Great art often arises out of transition and displacement. For the extraordinary Swiss-born, Boston/New York-based vocalist/composer Gabriela Martina creating a body of original music in her new setting has meant grappling with big questions and forging a singular sound out of a disparate array of influences, from jazz, funk and pop to gospel and Alpine roots music (as a child Martina yodeled in her family’s Swiss singing group). Martina’s arresting and utterly personal debut album No White Shoes introduces a rapidly evolving artist steeped in jazz but unfettered by the music’s prevailing conventions. To perform selections from her critically acclaimed debut No White Shoes, Martina will be joined by an international ensemble comprised of some of the most sought-after musicians on the scene today: drummer Vancil Cooper and bassist Kyle Miles, both from the United States, pianist Maxim Lubarsky from the Ukraine, and fretted and fretless guitar player Jussi Reijonen from Finland. Martina has cultivated a powerfully evocative sound with her crystalline voice, honed through concerts throughout the world. She’s performed with Meshell Ndegeocello, Jack DeJohnette, and Angelique Kidjo, and recorded with veteran drummer J.R. Robinson. In addition, she performed at the 2009 Montreux Jazz Festival in guitarist Lee Ritenour’s band as a semi-finalist in the Shure Voice Competition. Though No White Shoes includes a couple of brilliantly interpreted jazz standards, Martina focuses on improvisation-laced originals that combine singer/songwriter introspection with sophisticated harmonies. Informed and inspired by the quietly tumultuous process of acculturation, she uses music as a vehicle to wrestle with her protean identity. Martina is thrilled to present her music at Rockwood Music Hall. More information can be found at www.gabrielamartina.com.